Dhaka, 5 June, Abnews: Soldiers are helping firefighters search for missing people after Sunday's horrific volcanic eruption in Guatemala, when torrents of superheated rock, ash and mud destroyed villages. The official death toll from the destruction at the Fuego volcano has risen to 69, the authorities say. Thousands of people are being housed in temporary shelters. Volcanologists report the eruption, which sent ash up to 10km (33,000ft) into the sky, is over for the moment. "It is evident that the volcano's energy has decreased and its tendency is to continue decreasing. 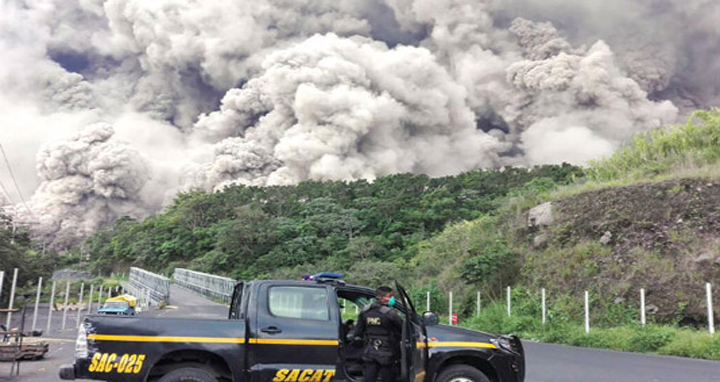 That is to say that there will be no imminent eruption over the next few days," said the head of Guatamala's National Institute of Seismology, Eddy Sanchez. The eruption generated pyroclastic flows - fast-moving mixtures of very hot gas and volcanic matter - which descended down the slopes, engulfing communities such as El Rodeo and San Miguel Los Lotes. Eufemia Garcia, from Los Lotes, described how she narrowly escaped the volcanic matter as she walked through an alley to go to the shops. Though she had found two of her children alive she was still searching for two daughters and a son and a grandson, as well as her extended family. "I do not want to leave, but go back, and there is nothing I can do to save my family," she said. Efrain Gonzalez, who fled El Rodeo with his wife and one-year-old daughter, said he had had to leave behind his two older children, aged four and ten, trapped in the family home. Local resident Ricardo Reyes was also forced to abandon his home: "The only thing we could do was run with my family and we left our possessions in the house. Now that all the danger has passed, I came to see how our house was - everything is a disaster." Firefighter Rudy Chavez descried how he was searching affected areas for survivors and also for those who had died. "We were about to evacuate the area when we found an entire family inside a home," he said.
" We worked to remove their bodies from the house. Someone raised the alarm that the area was very dangerous and we evacuated but thank God we met with our objective of recovering the bodies of those people." Jorge Luis Altuve, part of Guatemala's mountain rescue brigade, told the BBC how he and his colleagues had been up on the mountain searching for a missing person when they realised that the volcano's activity had suddenly increased. He heard something hitting his safety helmet and realised that it was not rain that was falling but stones. Volcanologist Dr Janine Krippner told the BBC that people should not underestimate the risk from pyroclastic flows and volcanic mudflows, known as lahars. "Fuego is a very active volcano. It has deposited quite a bit of loose volcanic material and it is also in a rain-heavy area, so when heavy rains hit the volcano that is going to be washing the deposits away into these mudflows which carry a lot of debris and rock.